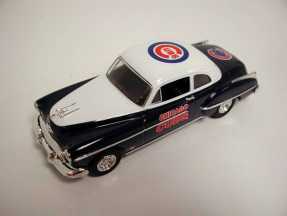 Ertl Collectibles (RC2) has announced the production of two unique and EXCLUSIVE Chicago Cubs and Chicago Bears 1:25 scale die-cast vehicles that will be offered for sale at this year�s National in Chicago. 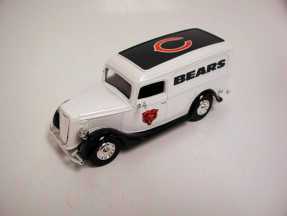 A Bears 1936 Ford die-cast panel van and a Cubs 1950 Oldsmobile Rocket 88 die-cast automobile are available to collectors on a limited basis. Only 500 of each die-cast car are being produced and each is sequentially serial numbered. Special 26th National price to consumers is $20.00 each. Regular suggested retail on similar limited edition die-cast vehicles is $24.99-29.99. Packaging features include a window box with team specific graphics. Special Ertl Collectibles die-cast vehicles will be available only at the RC2/Press Pass booth at the 26th National Sports Collectors Convention. For further information regarding this promotion, visit the National web site � www.natlconv.com.